Update 2017: Meigs' career has bloomed. In 2015 she was honoured with a Governor-General’s Award for Visual Arts. Also in 2015, The Gershon Iskowitz Foundation in partnership with the Art Gallery of Ontario (AGO) announced that Sandra is the recipient of the 2015 GERSHON ISKOWITZ PRIZE AT THE AGO. 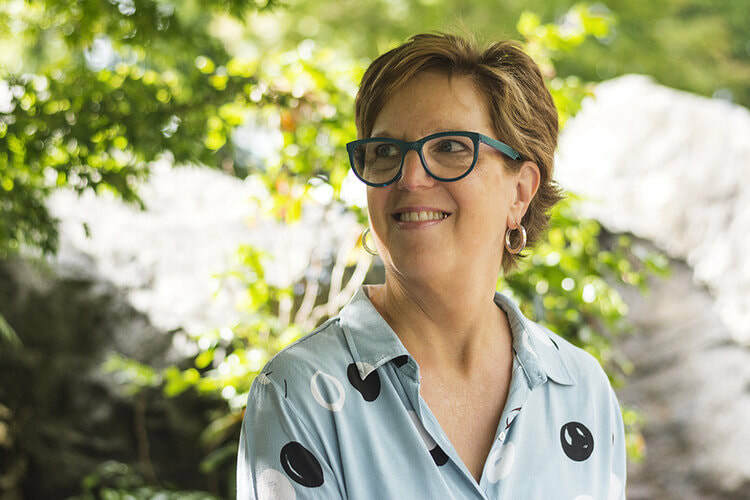 In 2017, newly retired visual arts professor Sandra Meigs was named a Fellow of the Royal Society of Canada (RSC Canada’s highest academic honour. October 19, 2017 - January 14, 2018. Four epic paintings by Sandra Meigs illuminate the walls of Open Spaces at this exhibition. A family of mobile robots called “Bones in Golden Robes” are guests at the show. The robotic family have plexiglass armatures and are mounted on circular moving discs. Clad in golden robes, they take turns moving up and down a raised narrow walkway. Meigs collaborated with sculptor Mowry Baden and musician Christopher Butterfield for "Bones". Sandra Meigs is an well-respected contemporary artist, and member of the Faculty of Fine Arts at the University of Victoria. She holds a Bachelor of Fine Arts and Masters in Philosophy. Her active career spans four decades, involving many Canadian and international exhibitions and publications. 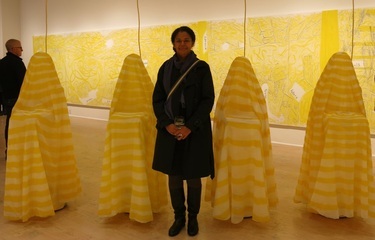 The Susan Hobbs gallery in Toronto has shown her work for twenty years. Meigs’ large-scale paintings are both playful and perplexing; they investigate architectural space, bodily sensations and psychological states. Full of visceral content and intellectual asides, the artwork requires viewing from various places. Detail: "Red. 3011 Jackson (Mortality)"
Background for "The Basement Panoramas". In 2009, Sandra was living in a 1922 house, built on Summit Hill. During her husband’s fight with cancer, Sandra became fascinated with the crawl space under the house. The large rock centrally placed in the crawl space, brought to mind a mortality chamber. Meigs used the space to investigate mortality, creating her current series The Basement Panoramas. After Paul passed away in 2010, hospice workers assisted Meigs in the grieving process. While meditating, she saw the image of a glowing yellow ghost. This experience brought about “Bones in Golden Robes”, a family of robotic ghosts premiering at Open Space. Drawing for Red, by Sandra Meigs. Meigs took photos of her basement space and pieced them together into wide view panoramas. From these photos, she made detailed drawings that include doorways, pipes, furnaces and tanks. Using text, she labelled the mechanical devices as elements: water, fire, air, light and darkness. The large rounded rock in the middle of the space became a ‘universal realm’. Meigs connected certain areas to physical and emotional places in her own life, such as upper world, dreams, imagination, building place, portal, bed, mortal and death. "Red. 3011 Jackson. (Mortality)" 6’ X 25’, acrylic on canvas (5 stretchers), 2013. Photo: Francis Sutherland. On November 1, the Legacy Art Galleries presents “Paradox: The Art of UVic’s Visual Arts faculty”. On November 1, the Legacy Art Galleries presents “Paradox: The Art of UVic’s Visual Arts faculty”. The exhibition includes Sandra Meigs and six of her colleagues. Director Mary Jo Hughes explains the exhibition title: Paradox by saying: "The faculty at UVic vary widely, yet share an interest in interdisciplinary practice. They often investigate the contradictory nature of individual experiences." For example, Meigs’ painting in the show “In the Highest Room” is from her Strange Loop Series. The fish eye view of the artwork pulls you in, but the humorous and cartoon like vista dispels the whole notion of realism. Drawing for Blue Painting by Sandra Meigs. 13 x 34 in. UVic's Visual Arts faculty encourages exploration and avoids "isms". Matt Trahan is a former graduate student of Meigs and now a Visual Arts instructor. His minimalist abstractions ponder how the mind orders reality and perceives phenomenon. He elaborates on the ideology of his mentors and colleagues. The faculty credo encourages focus on the actualities of each artwork, he notes, and avoids conceptual categories that generalize or over-simplify. “People often speak about the ‘human presence’ in Sandra’s paintings,” he says. And for Trahan, encountering a Meigs’ painting is like meeting a new person, complete with personality quirks. He recommends that viewers avoid any preconceived ideas about the characters in Meigs’ subterranean spaces, and take time to explore and discover. Sandra Meigs approached director Helen Marzolf two years ago about the exhibition. “Helen was very receptive,” recalls Meigs, “and the staff and volunteers have provided me with support and encouragement along the way.” Meigs had her first exhibition in an artist run centre, and believes Open Space is doing an excellent job of endorsing innovative art practices. Open Space has provided people with a fantastic opportunity to see this body of work in its entirety, explains Meigs. The paintings are so large, it might be the only chance people have. The exhibition includes a colour catalogue with essays by Toby Lawrence, Jen Hutton and Joan McNeely. “Blue. 1000 Mountain Rest. (Breath)” 6’ X 18’, acrylic on canvas (4 stretchers), 2013. Photo: Francis Sullivan. Open Space is an artist run centre that provides opportunity for artists of various disciplines to perform and exhibit. Since the 1970’s, centres have played a crucial role in the evolution of contemporary art in Canada. Open Space Director Helen Marzolf describes Sandra Meigs as an influential artist and educator. Each new Meigs series is a surprise: unexpected imagery, reinvented materials and always fearlessly direct and transportive. “It is so exciting for all of us at Open Space to be working with her,” she says. A world premiere of "The Basement Panoramas" unfolded at Open Space on Nov 1, 2013. Interviews with several guests follow. "Bones in Golden Robes" with onlookers at Open Space. While watching, it appeared to Maureen (at right) that the gliding creature was seeking her out. She wonders if the robots have heat-seeking devices? Maureen Bradley is a screenwriter, filmmaker and professor at the University of Victoria. She finds the meandering robots “Bones in Golden Robes” mesmerizing and hypnotic. Megan Dickie teaches sculpture at UVic. She refers to her own interactive sculptures, made from sensuous materials, as novelty gadgets. “I admire Sandra’s ability to combine both academic rigour and offbeat humour in her art practice,” she says. Dickie finds it refreshing to see an artist of Meigs’ international status embrace her own eccentricity while sharing a personal story. John Threlfall is Communications and Special Projects Officer, Faculty of Fine Arts at UVic. The former editor of Monday Magazine now blogs at Artsy Type, UVic. John is fascinated by the slouching, frazzled figure without a visible support system. “What is not there sums up the sense of loss in the painting,” he says. Meigs’ skill as a painter is shown through her use of minimal linework and negative space, used simply to convey overwhelming emotion. ​Kaitlynn McQueston is an MFA student in Visual Arts at UVic. A member of the Maker Lab, the sculptor is designing “Kits for Culture” with evocative materials. As a sculptor, McQueston was intrigued by Meigs’ description of the robots she was planning to construct. “Now I can admire the finished project and experience the vision of this very perceptive artist,” she says. Kevin McGinn stands with the central image in Meigs’ final painting. The swirling vortex reverses direction at the bottom and begins to push up. Meigs’ acceptance of this vast unknowable energy force that both takes and gives life, renewed her sense of peace and balance. Dr Cody Poulton teaches Japanese language, literature and theatre at UVic’s Department of Pacific and Asian Studies. For Cody, the exhibition creates a very special environment. Each painting tells a story using elements of composition such as line, colour and form. By using vast expanses of primary colours (red, yellow and blue) the artist creates visual drama, heightened by juxtaposition of the artworks. Kate Cino (left) with Sandra Meigs on Nov 1.